Do you need help using the Internet? I have a new book and it may just be the thing you have been looking for! 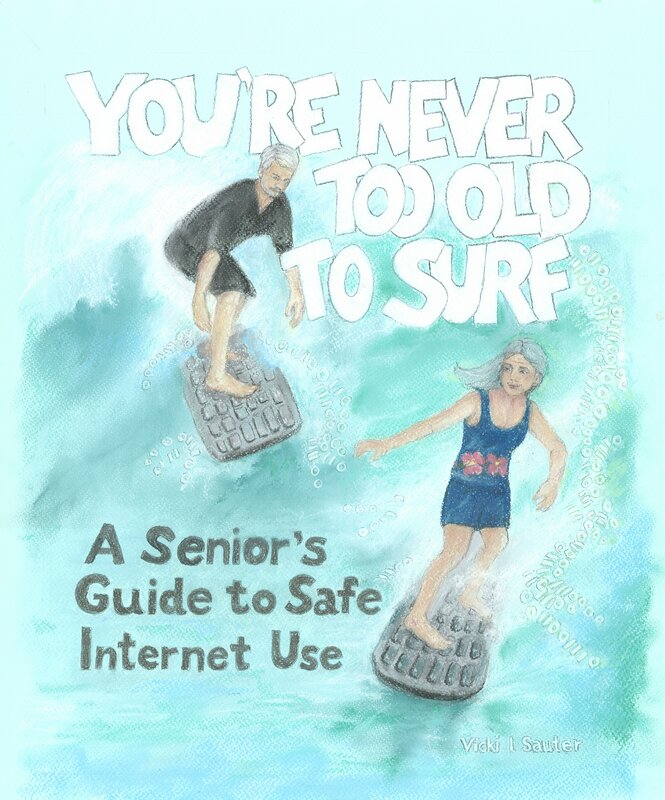 The name of the book is You’re Never Too Old to Surf: A Senior’s Guide to Safe Internet Use. This book is for you if you have ever wanted to harness the power of the Internet, but haven’t been quite sure what that means or how to do it. It is intended for the parents, grandparents and great-grandparents who want to use the wide range of tools that are available today on the Internet, from simply surfing the web to buying online, using email, blogs and even social networking sites. You may have sought guidance from your child or children only to be annoyed at their exasperated response to your questions. Or, you may have tried it on your own, and gotten frustrated with the tools, or had some problem result from that use (or know someone who did). You may be using the Internet, but just not feel very confident in what you are doing. If you fall into any of those categories, I wrote this book for YOU! Of course, if you are the child or grandchild and are having trouble explaining things to your elders, this book could help you too. The book is available from Amazon.com and BarnesandNoble.com. Your local bookstore can order it too. It is published through CreateSpace, ISBN 978-1506163857. Please give it a try and let me know how you like it. What do “free tickets on Southwest Airlines,” a “$1000 Visa Card, ” My Funny Name,” “My Name Talks,” and “Coke Giveaway” all have in common? Those are some of the recent scams available on Facebook. They have taken on an interesting twist now. Instead of a friend posting this on your news feed, you get an invitation to “like” a page. But, like the other scams, when you like the page, an application seeks permission to link to your profile, including personal information. The next step is for the application to post to your wall, posing as you, and sending messages to your friends. One can only guess what they do with the remainder of the personal information you provide. Although the method is slightly different from the “normal” approach, the result is the same. The advice that I provide is don’t click! You are never going to get the free information, products or whatever. When you are faced with a wonderful deal that is so very tempting, check before you click. You can check for these scams on Facebook security, Facecrooks and/or snopes.com, or even just a Google search to see what is written about them. What do you do if you have already clicked? Well, first and foremost, remove the applications that have been installed so they will not do any additional damage. Click on the small down arrow in the upper right hand corner of your browser, and select “apps.” Follow the instructions to delete the application. In addition, you must clean your news feed so that others do not see the offer and click on it. Select the “x” in the upper right hand corner of each listing that mentions one of these offers (it becomes clear when the mouse is run over it). Remember to follow the same rules that you do in real life — if the offer sounds too good to be true, it probably is. Walk away from such offers, or at least check them out before you provide data and access to them! For more information, you can check out the recent post on Facecrooks. Did you know that no one reviews applications before they are made available on Facebook? Most people think that if an application runs on Facebook that it was vetted somewhat or that it is, at least, reliable. That is not true, unfortunately. Anyone can write an application with any mission in mind. Once you give them access to your data, they unfortunately have your data and can do with it what they want. Clearly there are multiple kinds of applications developed. Some are developed by people who enjoy programming and want to develop something to show that they can program (many of these people are looking for jobs and putting it on their resumes). Others have developed applications for themselves, and share it out of kindness. These seem like harmless enough purposes, and they may well be. However, if they are not good at programming they may inadvertently cause negative things to occur. Then there are the people who just want to cause problems, or who want to collect information for nefarious purposes, or who are trying to scam users. Does that mean you should never use Facebook Applications? Certainly not. Some of them are quite useful, or quite fun and should be used. But, you need to protect yourself. You could adopt what has been identified as “Sauter’s First Law of Computing” — never be the first to adopt new computing (hardware or software). Let someone figure out how to solve the problems first! (An associated lemma says not to adopt new computing alone … always have a friend who can help you solve unanticipated problems.) Sometimes that is not possible, or sometimes you just don’t want to make your friends into guinea pigs. You could first search Google for the name of the application and see what it says about the application. Or, go to Facecrooks to see if they have a notice about problems with the application. Or check the Facebook Security . You can also go to the application’s Facebook page and look for information. Click on the “information tag” … is there a description and does it tell you who developed it? If so, check out the developers for their reputation. Check the number of users — you do not get extra points for being the first. Read the reviews of the application, to determine the experiences of other users. Think about the information to which they want to give access — does it make sense, or are they looking at more than they should really need to see? Think about the benefit of the application — is there enough advantage to make it seem reasonable? As I have said before, use the same “common sense” in the Facebook world that you would use in real life. Do not assume anyone else will protect you, but rather be a wise consumer of computing. CAPTCHA’s, reCAPTCHA’s and their cousins have become common anywhere you respond to something on a website. You may not know the name, but you probably have seen something that looks like the image below (taken from the CAPTCHA site). The term CAPTCHA (for Completely Automated Public Turing Test To Tell Computers and Humans Apart) was coined in 2000 by Luis von Ahn, Manuel Blum, Nicholas Hopper and John Langford of Carnegie Mellon University. Over 200 million CAPTCHA’s are solved every day. You tend to see the CAPTCHA’s on sites where you are registering (such as creating an email account) or voting (such as answering a poll). The goal is to prevent users from writing a program that could do actions automatically and thus overwhelm the system or bias the results. The CAPTCHA is used, for example, on sites that provide free email addresses to ensure that it was actually a human applying for that email address. Many people with questionable purposes were applying for those accounts, and using them to send spam or break into applications. While it is still possible to open an email account for those purposes, the existence of the CAPTCHA requires a person to be involved, and thus slows down the bad guys. The CAPTCHA’s are also used for any kind of online poll. So, for example, suppose your municipality wants to vote on the best location for a festival. In order to avoid computer-generated voting (to bias the results), they might include a CAPTCHA to be sure there is a person casting the vote. Sometimes blog sites include a CAPTCHA to ensure the comments on posts are not just spam. The CAPTCHA is an interesting use of the technology, but the reCAPTCHA does more. Early on we saw only one word used in a CAPTCHA, but usually you now see two as in the image above. When there are two words involved, it is called a reCAPTCHA. These puzzles not only prevent bots and spams from causing problems, they help to digitize books, newspapers and old time radio shows. Think about how long it would take to type in the content of an old book. Even if you use scanning software and text recognition software, it will take a long time because the original is old, yellowed, perhaps torn and for other reasons hard to read; the results of the scan and text recognition are not very reliable. An example of a scanned bit of text (taken from the CAPTCHA site) is shown below. You can see the errors in the interpretation. It would be useful to find a group of people who would help identify and correct mistakes from the scanning of the old documents. As stated before, there are over 200 million CAPTCHA’s solved each day, each taking about 10 seconds to do. If you could get the people using the websites to check the words, that would give you over 150,000 hours of work each day — FREE! But, you ask, how do you know if the person is entering the data correctly? The reCAPTCHA provides two words, one you know and one which is taken from one of these old books or magazines. When the person enters the two words, the software checks the first word (the one that is known) and if that word correctly matches, then we can assume the second word is correct too. If we have multiple people who receive the second word (the one from the old document), and they all agree on the word, we have more confidence that we have gotten the correct word. So, every time you enter a reCAPTCHA, you are not only preventing SPAM, but also helping to digitalize an old document! The CAPTCHA folks have other projects that we will address at another time. Scams and Spam — WHY? Last week I wrote about scams that can get to you via Facebook or email. Since I saw a few scams posted today, that have resulted in more spam I thought I would write more about it. The scam was on Facebook and it suggested Southwest was giving away free tickets such as shown below. Someone seeing this post clicked on the post and immediately everyone in his Facebook friends list saw this appear on their feed. It becomes spam for the rest of us because every time a friend clicks on it, the post is again on our feed. But, why is it a scam? Well, the unsuspecting person clicks on it and is first told that in order to be eligible he must share it with all of his friends. Since it seems like a good idea, the person is willing to do so. However, now the application has access to his friends list (which the person doesn’t realize is a bad idea until it is too late). Worse yet, the person is not entered into a drawing for the tickets at all. The person is directed to yet another site with a claim that he has just won another prize. This may continue for a while until either the sites claim more prizes are won if they only click through or until they try to sell something to the person. At the end, the original person has wasted time, annoyed his friends and maybe have information stolen from him. Everyone, Starbucks Corporation is giving away holiday giftcards. Hurry up, Do not waste a second. Heres the webpage – http://t.co/h3HbKe9P There just 303 left! If you follow this link, it asks you to post to Facebook, and you go through the same kind of pattern as with the Southwest example above. Note that Southwest and Starbucks are just as much victims as the rest of us. These scams leave a long trail of bad will toward their products. In other words, everyone loses. The question I am frequently asked is WHY do people create these things? Well, we know from my earlier post (and the suggestion above), that the spam is caused by unsuspecting people sharing what they think is a great deal with other friends. But, why the scam? There are as many reasons for this as there are for crime in the real (non-digital) world. Some people are just plain thieves; they want to direct you to a site from which they can steal your money or information so they can make “an easy buck.” Others may be people who just like the idea of controlling the behavior of a large number of people on the Internet. These folks do not want to steal anything from us but time because that makes them feel superior. Still others are young (generally) programmers who just want to learn how to make applications work. To them, it is fun to try new things; they do not really think about the harm in which they are putting other people. Another group think they are helping to drive traffic to particular sites to help in their marketing. Still others are trying to direct you to a site that will give you a message in which they really believe and want to encourage others to believe. The bottom line is that it does not matter WHY people do it. Instead, it is important for us all to protect ourselves from it. The most important thing to remember is, if it seems to good to be true, it probably is. If you are in Facebook when you receive the message, think twice about allowing any application access to your information. Never purchase from an unknown group and keep personal information personal. If you receive the information via email, never click on the link inside the email, always copy it and paste it into a browser. Finally, always check good deals or warnings out before sharing them with your friends so your posts do not become someone else’s spam; consider using snopes.com first. What is spam? The name always conjures up that bad ham product sold in the can. But here, I am using spam to mean unwanted email. It is the electronic equivalent to the junk mail we get in our home mailboxes. According to Wikipedia, spam accounts for almost 80% of all mail sent, but that may be due to differing interpretations of spam. In the broadest sense, spam includes all emails that you do not want. So, they may include those jokes you get from friends or the political statements from relatives. Sometimes those are liked, so they are not always spam. Spam also includes advertisements from legitimate stores with which you do business (again, sometimes these are desired emails). We do not really need to worry about these kinds of spam since they do little harm, other than wasting our time. A related kind of spam is the email that announce something totally false and ask you to forward it to all of your friends. Sometimes these are heart-wrenching like children being kidnapped or women being assaulted in a parking lot. Sometimes these are about poisoning, like anthrax being secretly put in common products. Or they might be about something you can win if you only forward the email. These do not harm YOU to resend them, but they do unnecessarily fill up the mailboxes of your friends AND spread incorrect information. Some spam might forward images or advertisements that are offensive to some users. While it is not clear why they do it, some people like sending pornographic images to unsuspecting users. For this reason, most mail programs have the default set to not showing photos when we open our email. But there are versions of spam that are worth the worry. Some spam involve phishing. These include offers of desirable products at a very low price, announcements of a problem with some legal paperwork or account, or some other way to get you to a site that is controlled by people with nefarious intentions. The goal of these individuals is to defraud the recipient into revealing information that can be used to steal money or one’s identity, or to sending money to a fake location. Spammers often use false names, addresses, phone numbers, and other contact information to make it difficult for law enforcement to find them. They also change their email addresses and Internet Service Provider often to make it difficult to find them. Is this legal? Well, since its inception, the Acceptable Use Agreement of the Internet (and of most ISP’s) has forbidden the sending of spam. In the U.S., mail is not spam (and therefore legal) if a “truthful” subject line, no forged information in the technical headers or sender address, and other minor requirements. Other countries, such as the European Union and Canada have more restrictive laws. But, the magnitude of the problem is too big for internet officials to pursue spammers. Fortunately, many spams are easily identifiable by their location, their subject or the contents of the emails. In those cases, your Internet provider has probably already moved the emails to your “spam” directory for you. You can look at them and even answer them (sometimes the spam filters are wrong), but generally you will just want to delete anything they put in that directory. This keeps affects of the problem to a minimum for most people. What can you do to help stop the problem? Think twice before sending that email to all of your friends and relatives. If there is an announcement in the email, check it out before you forward it. One site for checking the veracity of email messages is snopes.com. Yes, I am sure your friends are knowledgeable and well meaning … check it anyway. If the offer seems too good, ignore it. NEVER click on a link in an email, even if you know the person from which it was sent. What it says and where it goes may be two different things. Copy the email address and paste it to your browser if you really want to follow it. NEVER give personal information such as passwords, social security numbers or other identifying information over the internet. NEVER purchase (as in giving your credit card number) from an establishment that is not well known. Look for a secure connection and some form of approval such as verisign or Better Business Bureau. If it feels wrong, don’t go there. If you never heard of the company, don’t go there. Use the same methods of evaluating vendors that you do in brick and mortar stores. Yesterday, a dear friend posted this on my Facebook page. Hey Everyone…I’d like to keep my FB private except to those I am friends with. So if you all would do the following, I’d appreciate it. With the new FB timeline on its way this week for EVERYONE, please do both of us a favor. Hover over my name above. In a few seconds you’ll see a box that says : “Subscribed”. Hover over that, then go to “comments and likes” and unclick it. That will stop my posts and yours to me from showing up on the bar side for everyone to see, but most importantly it limits hackers from invading our profiles. If you re-post this I will do the same for you. You’ll know I’ve acknowledged you because if you tell me that you’ve done it I’ll “like” it. Of course, when you read it, you get alarmed. Facebook has been known for having problems with security and you want to do your part to keep your information private. So, do you do what your Facebook friend has suggested, and then repost it so your friends do the same? NO! As it turns out, this prescription is nonsense, started by people who do not know how Facebook’s security works and/or people who are just having fun with us. If you unclick what is suggested above, that means you will not see your friend’s comments and likes; it will not affect what other people see at all. This is actually where you control who can see things on your Facebook page. I recommend you set that to “friends” so that only your friends can see what is posted on your page. That will allow your friends to discuss what other friends have written. Of course, you can set it so that only you can see what is there or set it custom, so that only some of your friends can see it. Those settings provide greater security, but less opportunity for discussion among your friends. So, let’s go back to the original situation. Your friend has posted something to your page that seems important. It is probably a trusted friend, so what do you do? BEFORE re-posting the warning, CHECK IT! How? There is a Facebook page called “Facecrooks” which exists to check warnings like this. Take a minute and see what they have to say about it. Or, use your favorite search engine and query using some phrase in the message, perhaps, “Hover over my name above. In a few seconds you’ll see a box that says”. If it is a hoax, then it will most likely have a number of hits that discuss it. If you just forward it, you are propagating the hoax, and you don’t want to do this. At the very least, you are going to miss out on some of what your friend has to say. This is not just a problem with Facebook. Spam through email is a problem too. If you get a message about some deal that is too good, or a child who is lost or some terrible thing that is about to happen, check it first. My favorite place to check is Snopes. Checking the message first saves your friends from having unwanted mail, and may keep them from doing something that will have negative consequences.